New in at The Bioscope Library is P.D. Hugon’s Hints to Newsfilm Cameramen, a booklet produced in 1915. Hugon was managing editor of the American newsreel Pathé News, having previously worked in the editorial department of the British newsreel Pathé’s Animated Gazette and before that as foreign editor of the London Evening News newspaper. Hugon’s text is a common-sense guide to filming the news, just as newsreels were emerging as a standard feature of every cinema programme. Where speed is the dominant factor turn slowly, about half speed. Failure to do this is unpardonable. Remember then that you must shut down your iris diaphragm so as not to over-expose. Take all moving objects coming toward the camera, never going away. 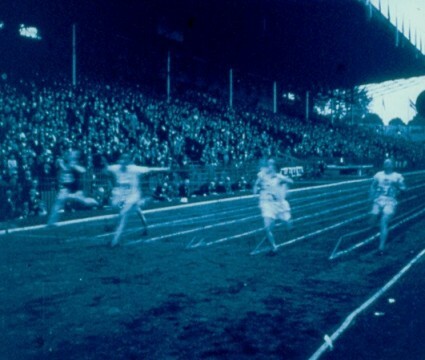 Every race must show at least four scenes: beginning, middle, finish, winner; and if possible an extra scene in the middle. Hugon covers such practical questions as filming in long and close shot, how to film sky, water and silhouettes, managing correct focus, exposure, shutter speeds, handling film and camera, how long shots should be, and has interesting strictures on methods such as panoramic shots. Panorams. There should never be a panoram, either vertical or horizontal, unless it is absolutely essential to obtain a photographic effect, and in any case the panoram should be, not from the main subject to others, but from others to the main subject, where the attention will finally rest. It is very much better to take two scenes than one panorammed scene. Panoraming is the lazy man’s remedy. Make as good a picture for others as you would like others to make for you. The guidelines seem particularly directed towards the freelancer hoping to sell footage to the main newsreel companies (his last words are “the money is there waiting for you”). They nevertheless provide a valuable insight into the practicalities and ambitions of early newsreel production. Hints to Newsfilm Cameramen can be found on the British Universities Newsreel Database website, with an introduction and afterword by historian Nicholas Hiley (the afterword discusses how much Hugon’s hints represent reality or an ideal).